Ecological Footprint [according to the IB]: The theoretical measurement of the amount of land and water a population requires to produce the resources it consumes and to absorb its waste under prevailing technology. Objective: To be able to evaluate the ecological footprint as a measure of the relationship between population size and resource consumption. Task 1 - Take the WWF Footprint calculator to work out your approximate impact on the planet. How did you do? What features caused your footprint to be bigger or smaller than your peers in the class? Task 2 - Take a copy of the map to the right hand side and write a commentary of less than 100 words describing the global disparities in ecological footprint values. Are there any surprises? Task 3 - Complete this quiz sheet. Match each of the IB Five to the data sets within. Remember they are China, Niger, Brazil, USA & Australia. Task 5 - Answer the question below using the image in the centre, and the key worlds below as part of your response. Global Hecate: The measurement of biocapacity and ecological footprint. There were 13.4billion hectares of biologically productive land and water on this planet in 2005. Dividing by the number of people alive in that year, 6.5 billion, gives 2.1 global hectares per person. Ecological Debetor: Country's whole ecological footprint is higher than their biocapacity. Objective: To be able to discuss the two opposing views (neo-Malthusian and anti-Malthusian) of the relationship between population size and resource consumption. Task 1 - What is Malthusian and who is it named after? Watch the first 4,40 minutes of the YouTube video to the right hand side and the slide 1-13 of the presentation underneath to create an A4 fact sheet on Thomas Malthus. Include facts, figures, projections & dates. Use the worksheet embedded on the blue tab above. Make sure you are clear on his views on the relationship between population size & resource consumption. This webpage is great too. Preventative checks: These are measures taken by humans to reduce shortages. This might be reducing population through better family planning and possibly anti-natalist policies. Or it could be reducing waste e.g. through better recycling. Positive checks: Despite their name, they are actually more negative solutions to resource shortages. These might be fighting and war or massive famines which actually reduce the overall population and therefore demand. Task 2 - Make a copy of the key terms above. Task 3 - What is neo-Malthusian? Neo-Malthusian: This is an idea of thought that follows Malthus's ideas. Paul Ehrlich and the ''Club of Rome" both have Neo-Malthusiasn ideas. Split into pairs. One person will be researching and completing a fact file on Paul Ehrlich and the other on the "Club of Rome". Your starting point is to study slides 14-35 on the embedded presentation. Again, make sure you are clear on their views of the relationship between population size and resource consumption in 2013. Study the 'Limits to Growth' model carefully. Developed by the Club of Rome it looked at population, natural resources, agricultural output, industrial production and pollution. They predicted that the limits to growth would be reached in 2070. The model basically suggests that ability of resources, food, the environment, etc. to meet human needs will be reached by 2070. Beyond this point if population is not controlled naturally, it will start to decline because of increased death rates. Task 4 - Take a copy of the graph above and explain three of the relationships shown using case study data from the IB Geography course so far. Task 5 - What are the limitations of this model? Anti-Malthusian: Anti-Malthusian is simply the school of thought that disagrees with Malthus's pessimism and is more aligned to Boserup's optimism i.e. that humans will always find solutions to shortages. Task 6 - Watch the two videos to the right hand side and outline their key message. Task 7 - You are now going to create your fourth and final fact sheet for Ester Boserup. Remember, it is vital to highlight her views of the relationship between population size and resource consumption. i. Outline the two opposing views of the relationship between population size and resource consumption. ii. 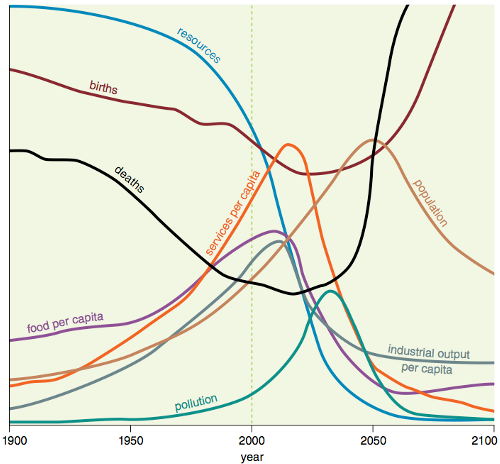 Analyse how the production of resources has kept up with rapid population increase. Download and print out the essay beneath, taking care to read the teachers annotations and highlight the key parts of the argument. malthus got it right - we are doomed! Answer Task 5 - The model has come in for some criticism because it does not look at individual regions that may be well resourced and underpopulated. It also doesn't take into account certain developments in technology like renewables, GM crops and desalination.